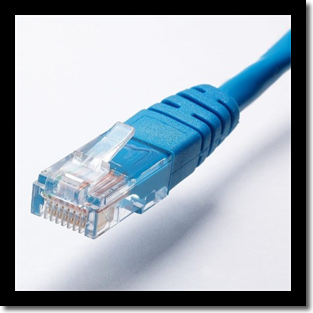 Ethernet cables are used to connect devices that belong to the same local area network: routers, computers, signal repeaters, and so on. They are quite similar with phone cables, even though they are a bit larger and have eight wires, rather than four. People used special Ethernet cables back in the day to connect two computers together, without using any other pieces of hardware. Those were called crossover cables, and since most local networks use routers these days, it's quite hard to find a cable like that now. It's easy to make one, though; you're only going to need to switch some of the wires at one of the cable ends. Modern Ethernet cables are either CAT5 or CAT6, with CAT meaning "category". The maximum length of a CAT5 cable can be a little over 300 feet, while the CAT6 cable can have a length of up to 700 feet. This figure is what specialists call the "maximum network diameter". Cables can be thin (also known as 10Base-2) or thick (10Base-5). With thin cables, cable length can reach 600 feet, while thick cables can even exceed a length of 1,600 feet under certain circumstances. Ethernet cables can be either solid or stranded. Stranded cables are much more flexible, so they are suitable for people who travel a lot, for example. On the other hand, solid Ethernet cables are less prone to electrical interference. It's what most businesses use for their wired networks, because they don't need flexible cables, and the performance improvement is often times noticeable. We've talked about long Ethernet cables and their limits, but even short cables may have their own problems, such as signal reflection. This happens when some of the network data/signal is reflected back to the signal source, rather than reaching the other end of the cable. Often times, this happens because the cable is (obviously) made of materials that aren't perfect. Fortunately, very few people experience this problem, and even when it happens, it's easy to fix it by simply replacing the short Ethernet cable with a longer one. As a general rule, a five feet Ethernet cable shouldn't cause any signal reflection. While both CAT5 and CAT6 cables can also be used outdoors, it is recommended to utilize the more expensive, weatherproof CAT6 cables. Most network builders prefer to run the cables through a plastic pipe, and then bury the pipe about eight inches under the ground. It is important to plan the network in a way that keeps these buried cables away from any interference source - power lines, for example.